When choosing the best grill, you really have two common choices – gas grills and charcoal grills, each that have their own set of advantages and disadvantages. The best grills under $500 come with all the right features for summertime cooking, but choosing the right one can be a daunting task. However, after diligently researching this space, and comparing several options together, we’ve narrowed down on 10 great options with mix of gas and charcoal models to ease your buying decision. The battle of the flame is an age-old debate between both novice and seasoned cooks, but when all said and done, choosing between charcoal and propane grilling completely depends on your taste buds. However, as a cooking enthusiast, it is good to know the key differences between the two types of flames to make a better choice according to the food being cooked. Starting with the taste, propane gas grills exude flavors that are mild, whereas charcoal grills impart smoky flavors. Adding to this, meat drippings meet the flame in a charcoal grill resulting in them becoming vaporized, and some of it penetrating the food for that smokier taste. Contrarily, the flame in gas grills is generally covered with metal or ceramic slabs, which prevents the spices or food drippings from touching the meat. On a brighter note, gas grills do produce a higher amount of steam than charcoal grills, which adds more moisture to the meat, so you eat fewer calories and use less spices to jazz up the food. In terms of cooking times, charcoal grills take longer to preheat, compared to propane grills that heat up quickly. To add to this, temperature in charcoal grills should be monitored constantly, whereas gas grills retain temperature well. Speaking of temperature, it is easy to control in propane grills, and can be adjusted easily when higher or temperatures are needed. However, controlling the temperature in charcoal grills can be done by either closing or opening the vents or increasing the cook time. In terms of cleanup, charcoal grills can leave a big mess with sometimes stubborn ashes, whereas propane gas grill are more convenient to clean with a removable ash tray. With regards to maintenance, you will have to refill propane tanks, replace the flavor briquettes, check gas connections and lines in gas grills. And with charcoal grills, you generally have to replace the grill grates annually, depending on wear and tear. When it comes to safety, cooking on a charcoal grill can be risky business, where the charcoal can ignite in high winds or burn your hand. Gas grills aren’t susceptible to winds, making them a safer option than charcoal grills. Lastly but worth mentioning are the costs associated with each type of grill, where charcoal grills feature less parts hence are usually cheaper compared to propane grills due to their mechanisms and complexity. Grill size – gas grills are available in several different sizes, but if you’re going to be cooking large batches of food, you need a grill with a larger grilling surface, generally measured in square inches. 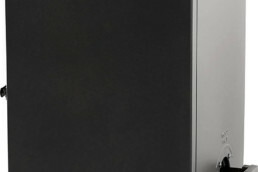 BTUs – British Thermal Units is the ability of the gas grill to produce heat, and how much heat a respective gill uses. However, it is important to note that higher BTUs do not guarantee better cooking or preheating, so buy a gas grill that offers a minimum of 80 to 100 BTUs-per-square-inch. 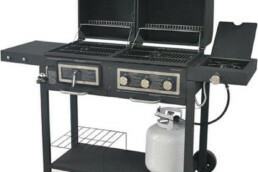 Burners – gas grills generally come with two burners, which are a good choice for 4 hungry people. But grills with more than two burners offer better even heat distribution than those with two or less. Construction – since a gas grill is not an appliance you should be replacing often, it is important to buy one that is made high quality materials and will last the test of time. 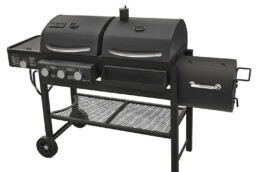 Common materials used in gas grill construction include stainless steel and cast aluminum. Cooking grates – gas grill cooking grates are generally made from cast iron, stainless steel or are enamel coated. Cast iron grates provide optimal heat transfer, whereas stainless steel grates can be cleaned easily and offer excellent heat absorption. High quality enamel coated grates are rust proof and easy to clean. Size – there are two factors to consider when determining the size of a charcoal grill – portable grills that are easy to carry around such as kettle or ceramic grills or ones with large cooking spaces that are generally bulkier. Temperature control – the lids of the best charcoal grills come with dampers, which let oxygen in and others that let exhaust out. Then there are charcoal grills that let you move the coals away from the cooking surface, making it easy to control the heat your food is exposed to. Ease of use and cleaning – charcoal grills require a fair amount of effort to them started, so you will have to be patient when firing them up. 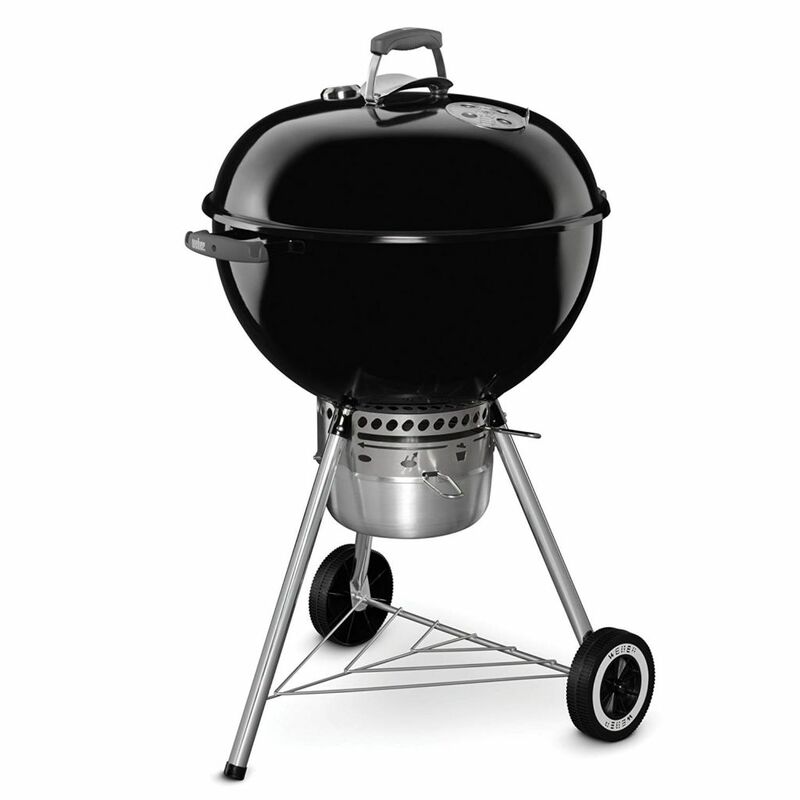 Some charcoal grill models come with an extra door or hinged cooking grates, making it easier to add more charcoal. 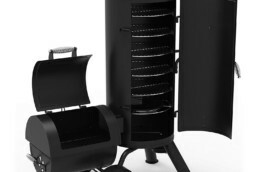 Additionally, the best charcoal grills are equipped with a removable ash catcher to easily contain and dump the accumulated ashes for easy cleanup. Weber is a company that is renowned for producing some of the best grills in the world, and the Original Kettle Grill is yet another hit addition to the company’s lineup. It can be ordered in a choice of three appealing color options – black, copper and green, each with an impressive capacity to cook 13 burgers at one time. The temperature of the Weber Kettle grill can be controlled without lifting the lid thanks to the adjustable dampers. These dampers when shut will completely cut off the oxygen supply flow and gradually extinguish the coals. 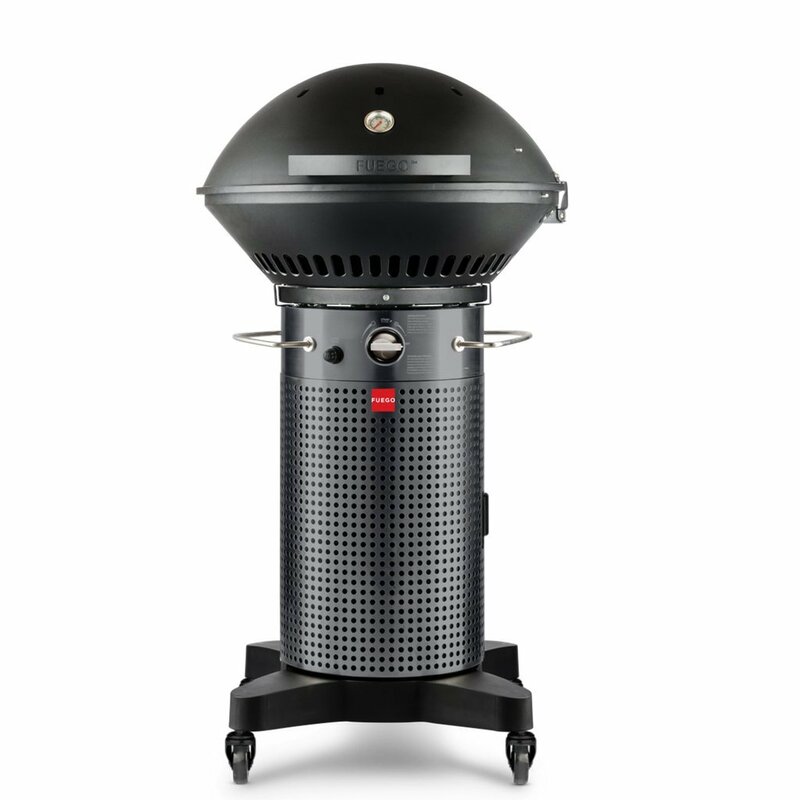 Further, the grill is built tough to withstand high temperatures, and the charcoal can be adjusted on the grate for either direct or indirect cooking. In terms of maintenance, the Weber Original Kettle grill features a One-Touch cleaning system that offer fuss-free cleanup of ash and debris by sliding them into the onsite removable ash catcher. Speaking of cleaning, the grate not only works great at retaining heat, but is also easy to clean and features a hinged design to make it easy to add charcoal while grilling. The lid of the grill is equipped with an angled hook, which allows you to secure the lid on its side instead of setting it on the ground. The lid handle has a heat shield to prevent it from getting too hot. The side of the grill is fitted with hooks to hand grilling tools such as tongs and spatulas. Moving the roughly 32 lbs grill can be easily done with its onboard durable wheels. Kamado style cooking gets its roots from India and China thousands of years ago, except that food was cooked in earthenware ovens back then. But now you can indulge in these same tantalizing smoked flavors in your backyard with the Char-Griller Akorn Jr. Kamado Kooker grill. This compact yet highly efficient grill stands roughly 25 inches tall and 21 inches wide, and is built to last and retains heat thanks to its triple walled 22-gauge steel exterior construction. 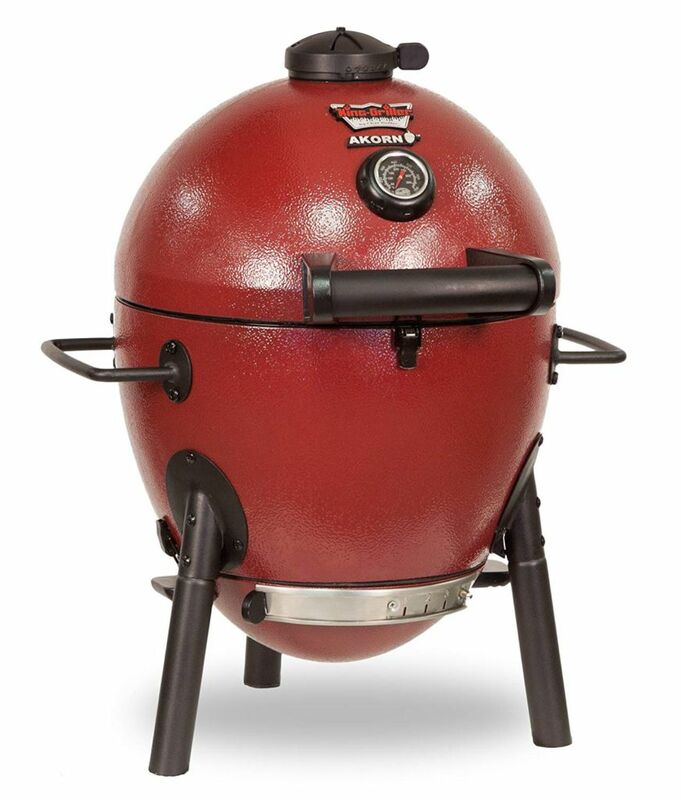 The robust construction of the Kamado Kooker grill allows it to maintain temperatures between an astounding 200 to 700 degrees Fahrenheit in its porcelain coated steel interior. It is equipped with dampers at the top and bottom to help maintain uniform air flow in and out of the grill when smoking or grilling, and an easy dump ash pan for quick and easy cleanup. Another noteworthy feature of the Kooker grill is its large 14-inch diameter cast iron cooking grate, which allows you to cook more and anywhere – camping, park, tailgating or in the backyard. With regards to portability, the grill can be easily hauled around with its two integrated handles, and can be set on its short yet extremely sturdy legs when grilling. The Weber Performer Deluxe Charcoal grill is in a league of its own, mostly owing to its large 363 square inches of cooking real estate tucked away into a 22-inch porcelain enameled bowl. Unlike most other grills that come with an analog timer, the Weber Performer steps it up a few notches with a removable LCD cook timer mounted to the work table of the grill for easy access and setting of timers for preheating and grilling. But that’s not all, this feature rich charcoal grill by Weber features an onsite lid mounted thermometer that indicates the temperature inside, so that you can make the necessary adjustments. 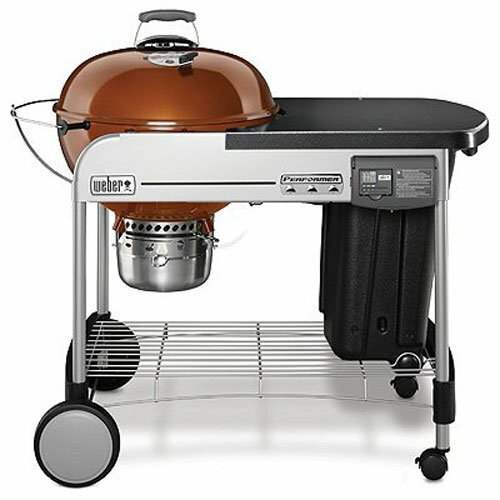 The Weber Performer charcoal grill comes with an electronic Touch-N-Go gas ignition system, which allows you to fire it up with the push of a button, hooks to hang grilling tools, and adjustable dampers to control the temperature without lifting the lid. Speaking of the lid, it can be placed right on the side of the grill rather than the ground, and is equipped with a heat shield to prevent the handle from getting hot. The grill tips the scales at roughly 90 lbs, measures 30 x 48 x 43.5 inches, and offers extra space with its onsite work table to keep platters, seasonings or prep food. 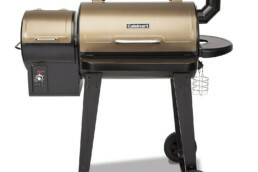 If you’re looking for a propane grill that will offer years of grilling pleasure, the Monument Grills propane gas grill is hard to beat, most notably owing to its onsite rotisserie functionality. It offers 513.3 square inches of primary cooking area, and 210 square inches of warming rack cooking area and a side burner, and an astounding total of 72,000 BTUs of cooking power. 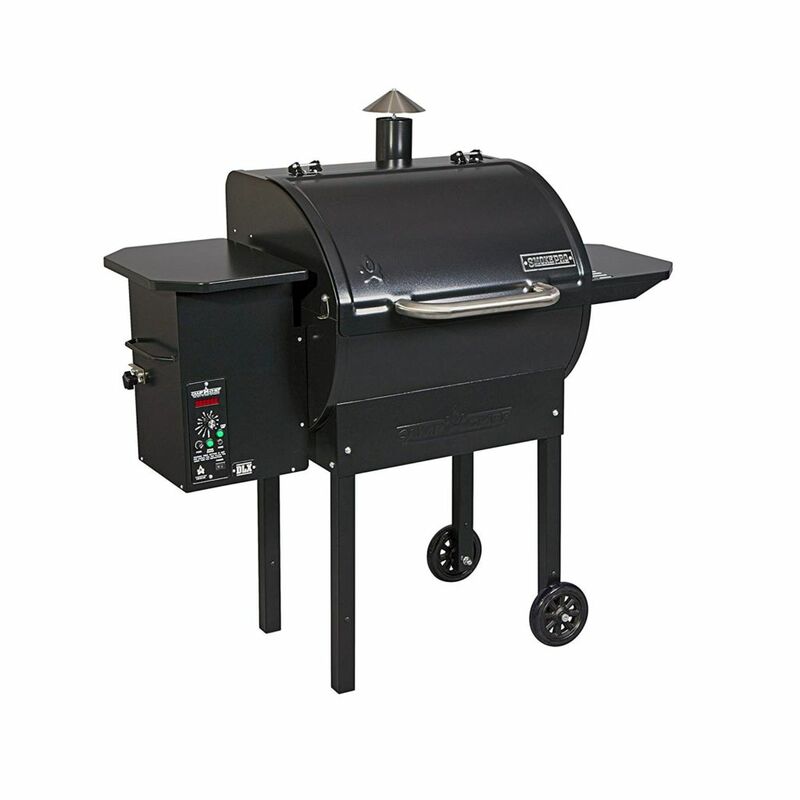 This grill boasts a rugged design with its all stainless steel body, and is equipped with a total of 6 stainless steel burners – 4 in the primary cooking area, 1 in the side burner and other in the searing area. It is topped with a robust 430 steel weld lid that is embedded with a thermometer, and an appliance grade see through window for easily viewing and temperature control without opening the lid. 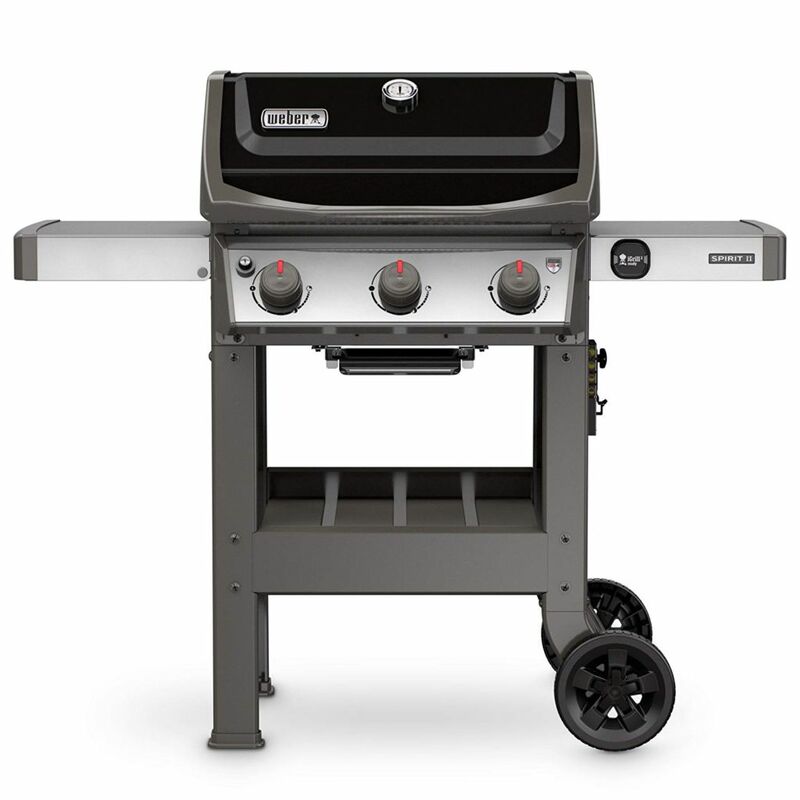 The grill comes with LED lit cooking knobs, a 29 inch porcelain coated enamel firebox, and cast iron cooking grates, which are not only easy to clean but are great at retaining heat. 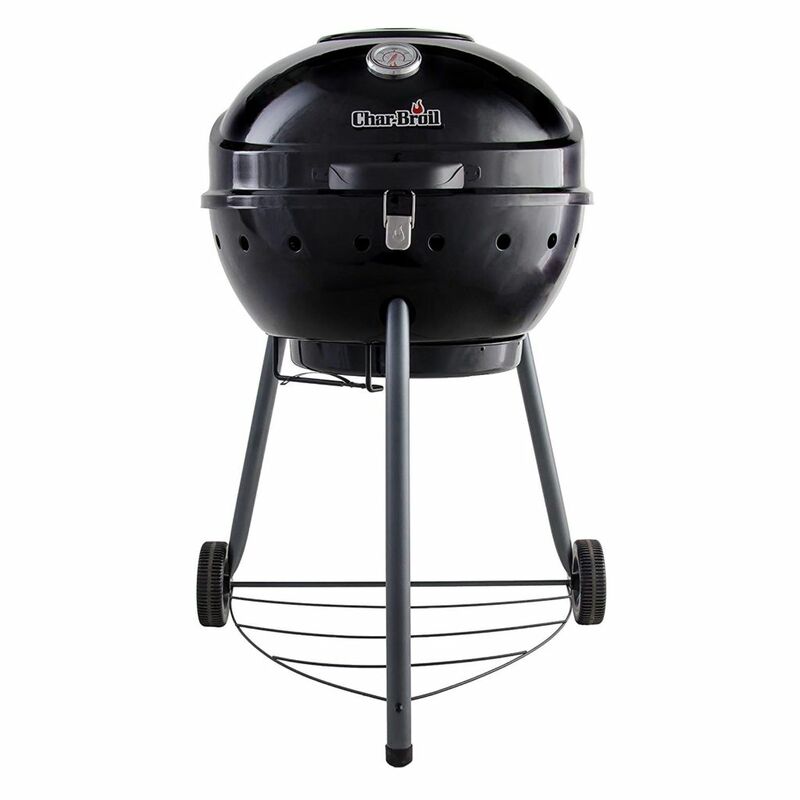 This propane grill from Monument Grills can be fired up easily with the integrated pilotless ignition system, which are designed to turn the burners on instantly and without using any pesky matches of lighter fluid. It comes with silver base, back and side panels, measures 32 x 25.5 x 25.2 inches, and weighs roughly 118 lbs, yet is easy to move around and secure in place with its onsite 4 locking nylon wheels. 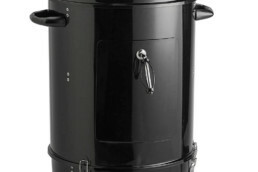 They say looks can be deceiving, and what may seem like an oversized trash can is actually a large capacity charcoal grill that cooks meals fit for millionaires. 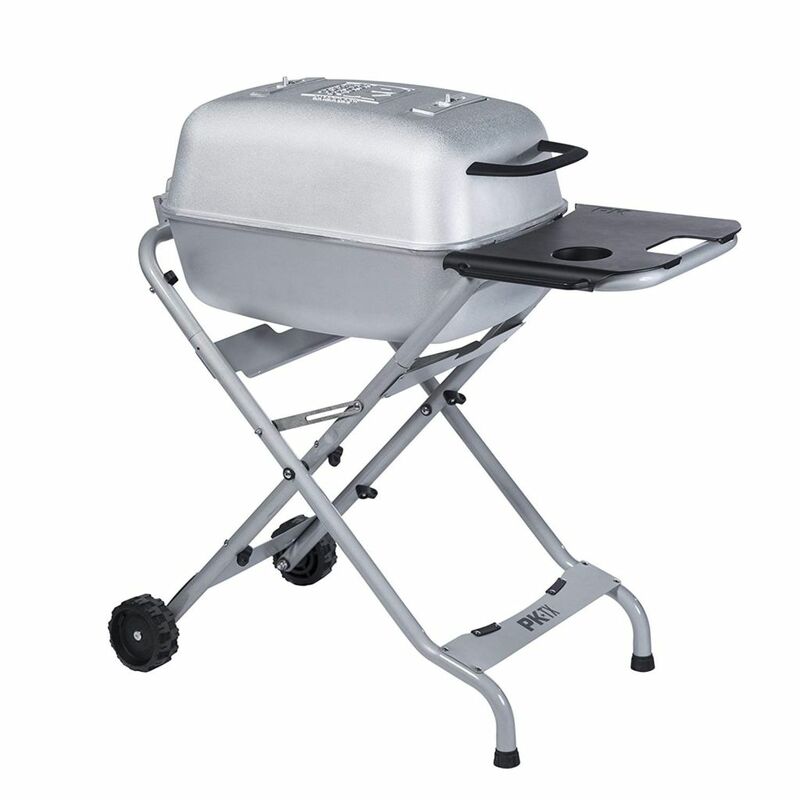 In terms of durability, the Original Po’ Man charcoal grill leads the pack with its robust rolled steel and stainless steel construction, so you can rest assured it will serve you well for many years to come. This trashcan gourmet grill measures 16 x 16 x 21 inches, and weights 20 lbs, making it easy to haul around to tailgate parties and cookouts. The grill is easy to assemble and use, and features multiple levels in its interior to accommodate ribs, chicken, hanging wings, large cuts, etc. 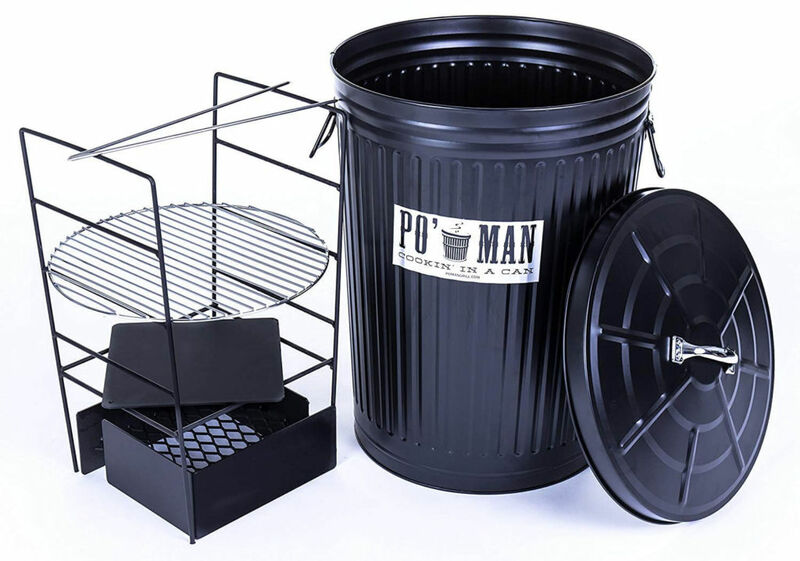 Getting started with the Po’ Man charcoal grill is easy, where you first line the bottom of the can with aluminum foil for easy cleanup, fill the deepest side of the coal box with coal and place over starter cup. While the coals are getting hot, assemble the cooking racks to cater to the foods being cooked, and set the drip plate on the 1st level cooking rack. Lastly, set the lid with a 1/4-1/2 inch gap, and let the Po’ Man charcoal grill work its magic. The Coleman Company, founded in 1900, is one of the biggest names in the outdoor equipment space, and the RoadTrip propane grill is yet another hit addition to the company’s product range. Unlike most other grills that are often only available in only a black color variant, the RoadTrip can be ordered in a choice of 5 exciting colors – black, blue, green, orange and red. This portable grill measures 30.2” x 19.2” x 16.1”, weighs less than 50 lbs, offers 285 sq. In. of cooking area, and a total of 20, 000 BTUs of grilling power, which is surprisingly high for a grill of its size. Further, the Coleman RoadTrip portable gas grill is easy to pack up and setup at your campsite or tailgate, and can be hauled around on its two rugged wheels just like a suitcase. The Coleman RoadTrip grill isn’t just appealing from the outside, but has a lot going on under the hood, starting with its three independently adjustable burners for optimal temperature control. The grill can be fired up with the onsite push button, so no matches to deal with, and features improved burner technology, which provides 20 percent better control over its burners. It comes with high quality cast iron grates, which can be swapped on the fly with griddles or stove grates (sold separately) for more cooking options, and two sliding side tables to store sauces and utensils for convenient cooking. If you’re looking to step up your grilling game, the Weber Spirit II E-310 gas grill is perhaps a great option. This three-burner grill can be ordered in a choice of 4 appealing color options – black, ivory, red and sapphire, and in 2 fuel options – propane and natural gas. It offers an expansive 529 square inches of cooking space, and is powered by a class leading and patented Gs4 grilling system – a high performance grilling system. 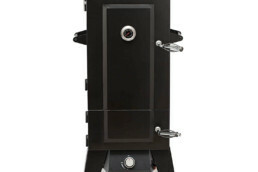 This system includes an Infinity Ignition system, high performance burners, Weber’s unique porcelain-enameled Flavorizer Bars, and a convenient grease management system. The Infinity ignition system of the Weber Spirit II is made up of 4 key elements — module (redesigned for more consistency and away from the heat), wiring (heavy duty coating), electrodes (weather and heat resistant) and ignition switch (independent ignition). The burner tubes of the Weber Spirit II propane grill offer consistent gas flow throughout the grill for even cooking, and are backed by an industry leading 10-year warranty. Its angled Flavorizer bars are engineered to add succulent smoky flavor to your foods by catching the drippings that smoke and sizzle. Drippings that aren’t vaporized are funneled down into the grease management system. Furthermore, the Weber Spirit II burners offer 30,000 BTU-per-hour input, and are mated with a fuel gauge, which indicates the amount of fuel left in the tank. It comes with reversible porcelain enamel cast iron cooking grates, where the thin side is a great choice for cooking delicate foods such as shrimp, and the wider side works great to create thick sear marks and enhance the flavors of your food. The warming rack under the cook box allows you to keep foods warm, and its open cart design with 6 tool hooks keeps tools out of the way yet still accessible. 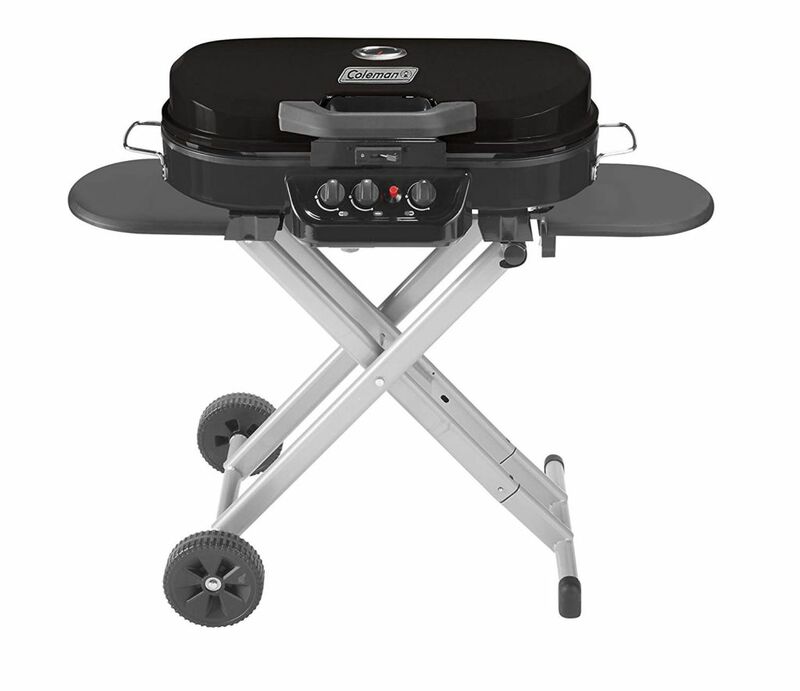 The Weber Spirit II propane grill features two sturdy wheels to move it around easily, and an easily, one button foldable side table for extra room to work on. The Camp Chef PG24DLX Deluxe Pellet Grill boasts a class leading digital control system that arrives complete with a smart digital temperature control, and an automatic pellet feeder system for consistent heat and optimal amount of smoke. 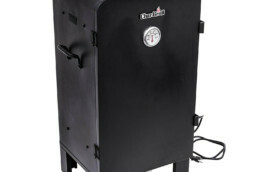 The digital control system of this grill/smoker allows you to control the temperature between 60° F and 500° F, and features a digital readout to take the guesswork out of the cooking process. it offers 25,000 BTUs of cooking power, 429 square inches of cooking real estate in the main cooking area, and 144 square inches of cooking space in the side cooking rack, giving you plenty of room for all types of cooking – grill, smoke, bake, roast, braise, barbecue, etc. In terms of maintenance, the grill scores high with a patented ash cleanout system, which empties the ash with the push of an onsite lever. The Camp Chef Deluxe Pellet Grill has a 3,778 cubic inch chamber capacity, is equipped with a side shelf to store condiments, etc. and a rather large 18 lbs hopper capacity. This wood pellet grill from Camp Chef is a set it and forget it style appliance, and offers great versatility right out of the box. The Fuego Professional F24C is a propane gas grill that rings in with a rich set of features, some that are only seen in much higher priced models in its segment. For starters, it offers a total of 525 square inches of cooking space – 415 square inches in the main area and 110 square inches in the warming area. 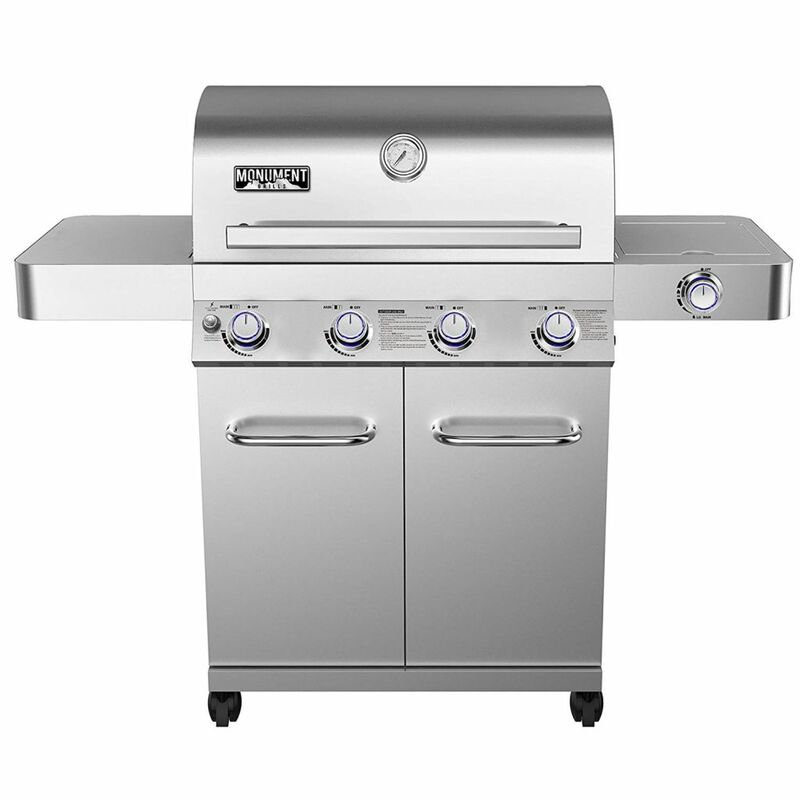 It features a dual zone burner system for direct and indirect grilling at 26,500 BTU/HR and 18,500 BTU/HR respectively. This grill is inspired by the award winning design of the Fuego Element, and can be easily moved around with its non-marking industrial wheels. Unlike other grills, the Fuego Professional F24C grill has a concealed propane tank storage that can be secured with a close door latch to prevent annoying rattles. Firing up the grill can be done with the easy-to-use push button ignition system, which when triggered heats up the grill to 500 degrees F in just under 5 minutes. It is equipped with a 45-degree hinged lid to prevent reaching over the fire, and is easy to clean with its residue removal system. This grill from Fuego is easy to assemble with just a box cutter and phillips screwdriver to secure just 20 fasteners. The Char-Broil Kettleman doesn’t fail to impress with its compact footprint, yet still manages to squeeze in 360 square inches of cooking space. It is fitted with a hinged lid and temperature gauge to easily know when the cook is ready to be served. The lid is equipped with a large, adjustable damper that can be opened to let heat out, and closed to increase the temperature inside. 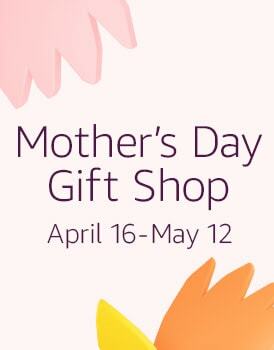 It can also be latched down to secure It on the go. The Char-Broil Kettleman grill features a best-in-class TRU-Infrared cooking system, which uses infrared technology for greater temperature control and to cook food evenly. Adding to this, the TRU-Infrared charcoal cooking grates of grills are engineered to cook more with less charcoal, and create a solid barrier between the food and flames, so you can say goodbye to flare-ups. Its large adjustable cooking grates are rust resistant, and prevent hot and cold spots on the cooking surface of the grill, and accelerate cooking times with less fuel consumption. At the bottom of the grill lies a 360-degree air inlet system, which provides increased airflow for more even heating. The grill sits on two wheels for easy mobility and comes with a slide-out ash pan to capture the ash and empty it. The Char-Broil Kettleman infrared grill features a chrome plated wire shelf at the bottom that helps prevent it from tipping over, and can also be used to keep grilling accessories. To top things off, the grill is backed by a 10-year warranty on the firebox and lid, 5-years on the ash pan, and 2-years on all other parts. 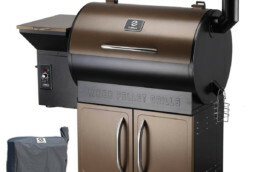 The PK Grills PKTX grill and smoker slots in at the #10 position on this list of best grills under $500 owing to several reasons, most notably its unique capsule design with four vents for grilling hot and fast or low and slow. It can be ordered in a choice of three colors – graphite, silver and matte red, and is made from high quality, lightweight, durable and rust proof stainless steel. The material used in its construction also allows the grill to conduct heat 4 times faster compared to stainless steel made grills, and offers excellent heat retention and airflow control. Even with its compact footprint, the award winning PK Grills PKTX grill offers a large 300 square inches of cooking area, and can be folded down easily and transported on its two wheels. 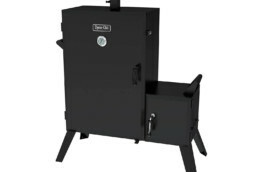 This low maintenance charcoal grill is a slick option for anyone in the market looking for a smoker and grill combo, and for those with smaller backyard spaces. It is not only easy to assemble and disassemble, but features an easy to manage, yet highly effective, minimal heat control system. 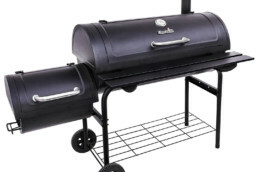 The range of cooking appliances mentioned on this list of best grills under $500 are some of the best you can buy in this segment. Most if not come with a rich set of features, and are constructed from high quality material, so you can rest assured they will offer years of BBQing pleasure.